Home → Blog → Boating through the Surf at Horseneck Beach. Boating through the Surf at Horseneck Beach. Boating through the Surf at Horseneck Beach. 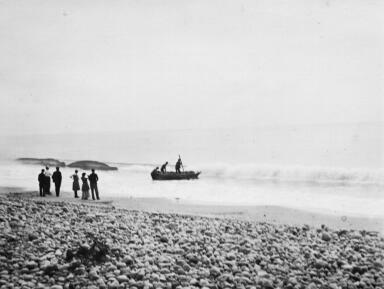 Putting a small boat into the surf from Horseneck Beach was a challenge with which many Westporters were most adept. The boatman is here using a pole or his long oar to hold his bow into the breaking surf as he guides the boat to flatter water.